Planning is already underway for SXSW 2015! South by Southwest (SXSW) is one of the most popular festivals and trade shows for the creative and interactive industries in the US. SXSW was held in Austin in March and while all the Swedish participants have gone back home, the buzz has continued long after the event concluded, and plans are already being made for an even greater presence next year. Swedish media covered the event as you can see in the attached article (below). With around 400 Swedes present, Sweden was well represented at this year’s edition of the interactive part of the SXSW festival with big names such as Spotify, King, and Toca Boca. 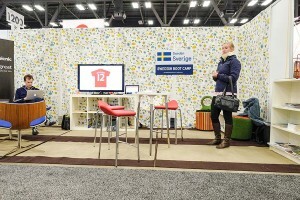 Sweden even had a booth at the SXSW trade show promoting Swedish creative industries. If you are interested in participating in the Swedish SXSW efforts for next year, please contact rwendt@boundlessnetwork.com. The planning for next year is already underway and it’s going to be a fantastic opportunity to get visibility both in Sweden and here in the US. Notified: Ses vi på SXSW?